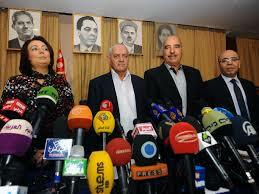 Tunisia's National Dialogue Quartet has won the 2015 Nobel Peace Prize. Norwegian Nobel Committee said in Oslo that the prize was awarded to the Tunisian National Dialogue Quartet for its decisive contribution to the building of a pluralistic democracy in Tunisia in the wake of the Jasmine Revolution of 2011. There were 273 nominees for the Peace Prize of which 205 were people and 68 organisations. The Quartet was formed in the summer of 2013 when the democratization process was in danger of collapsing as a result of political assassinations and widespread social unrest. It established an alternative, peaceful political process at a time when the country was on the brink of civil war. It was thus instrumental in enabling Tunisia, in the space of a few years, to establish a constitutional system of government guaranteeing fundamental rights for the entire population, irrespective of gender, political conviction or religious belief. The National Dialogue Quartet has comprised four key organizations in Tunisian civil society: the Tunisian General Labour Union (UGTT, Union Générale Tunisienne du Travail), the Tunisian Confederation of Industry, Trade and Handicrafts (UTICA, Union Tunisienne de l'Industrie, du Commerce et de l'Artisanat), the Tunisian Human Rights League (LTDH, La Ligue Tunisienne pour la Défense des Droits de l'Homme), and the Tunisian Order of Lawyers (Ordre National des Avocats de Tunisie). These organizations represent different sectors and values in Tunisian society: working life and welfare, principles of the rule of law and human rights. On this basis, the Quartet exercised its role as a mediator and driving force to advance peaceful democratic development in Tunisia with great moral authority. The Nobel Peace Prize for 2015 is awarded to this Quartet, not to the four individual organizations as such.